3 A# 2 3rd fretfr. 2 C# 1 2nd fretfr. Chord F#7 notes: F#, A#, C# and E. You must leave out the 6th and 5th strings. The string 1 (E) is left open. 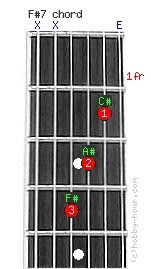 F#(Gb) dominant 7th chord's alternative names: F#dom7, (F# septim).